I absolutely love watching the hummingbirds come to feed this time of year. I anxiously wait for the first little flyer to show up in the spring and I spend the summer mesmerized by the tiny hummers. They are tiny but they can be fierce. There are enough spots for all of the birds to sit and drink at the same time but there is always one bully bird waiting nearby to chase the hungry birds. 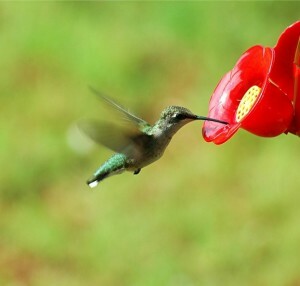 I never tire of watching the tactical maneuvers of the hummingbirds as they fight for a spot at the feeder. I’ve been sitting on my back porch watching them chase each other and had them whiz close by my head. And I’ve been sitting inside when one flies into my big window – mistaking the reflection of the sky for the actual sky. The poor little bird falls to the ground, stunned but rarely injured. After a few minutes, the birds seem to “shake off the stun”, test their wings and fly off unharmed. That’s what happened until our spaniel dog, Copper, figured out what the thump on the window meant. (You can learn more about Copper’s life lessons here and here.) The first time Copper heard the thump, he was just curious and protective so he ran out the dog door to investigate. Copper is a sweet dog but his instincts are too strong to fight so when he saw the bird on the ground, he snatched it up. I hollered at him to “drop the bird” but he just looked at me with a long beak sticking out of his mouth. I could tell by his eyes he didn’t want the bird in his mouth but his natural instincts would not let him open his mouth and set the bird free. I walked away hoping he would spit the bird out. Nope. I offered a dog treat, hoping he would spit the bird out. Nope. The bird didn’t make it. Neither did the next one and the next one. Painful hurts can stun us. As I watch the tiny hummingbirds sit still after they’ve hit the window, I see their hearts beating in their chest – alive but unable to move. Painful hurts can emotionally paralyze us – causing us not to trust, to lose faith, or to become hardened. We are alive but not moving through life with joy and hope. When we are hurt, if we take time to heal and seek the Lord’s help for our pain, eventually we can stretch our wings and fly again. But all to often, we don’t wait and much like Copper snatches up the stunned hummers, Satan snatches us up – causing us to make decisions and choices we normally wouldn’t make. We feel powerless as the jaws of hurt threaten to destroy us. But Jesus heals not only our physical bodies but also our emotions. When we are stunned by our hurt, that is the time we need to breathe and wait for the pain to pass as Jesus restores us. Then we can stretch out our wings and once again soar with joy, peace and hope lifting us. “But in my distress I cried out to the Lord; yes, I prayed to my God for help. Have you ever been stunned by pain? What helped you soar again? Are you able to soar? Leave a comment. Let me know if I can pray for you. Note: I have moved my feeders and pull the shade on sunny days so Copper can’t have a little snack. Share the post "What Hummingbirds Taught Me"
Shelley, I know it hurts when we are stunned and am glad that you have not allowed satan to devour you. Moving forward with Jesus is the best plan. And He does have a great plan for you! Don’t doubt that! Shake it off and soar. Thank you for this beautiful offering. I love hummingbirds but rarely see them around me. What I love are the lessons that God gives us in the least expected things. Who would have thought that a tiny hummingbird would leave us with such a big lesson? Thank you. I love when the Lord uses the things around me to encourage and teach me. Please pray for me and my family. Loved your message! Praying for you and your family! May the Lord bless you! Hi Shelly, this is my first visit to your site, and I found you through the #matt1020 linkup. I also love hummingbirds, and I enjoyed your spiritual application. Sharing this on Facebook and Twitter! So nice to “meet” you! I can’t wait to dig deeper into your devotionals. I have led women’s studies for years and your topics are so needed. Thanks for stopping by and for the shares! Lovely post😍 The story of the hummingbirds flowed effortlessly into our application as Believers. So compassionate and spot on. Great job and thanks for sharing.